Now the XWLP9 ICS 4.0.3 firmware can we applied on the device Samsung Galaxy S2 GT I9100 and also be informed that this is an official release for To Mobiles but only restricted to Poland users and make sure you may not apply it on any other international devices. Also, this update would fix all the bugs and issues regarding battery and earlier the games on HD which were forced to be closed, this problem is also been fixed. If you’re on any other Custom ROM, then just make sure that you cleared the cache and also wipe all your data from recovery mode. 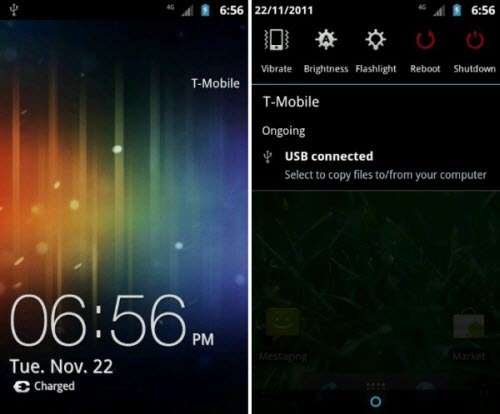 The ROM we would see today is compatible only with T-Mobile Galaxy S2 GT I9100. So, make sure you try this ROM only on this device, not any other device by any company. Grab the ROM from the following link:- Torrent Download. After downloading the ZIP file, extract it onto your PC. Download Odin 1.85 and open it in your computer. Now you need to enter your device into download mode which can be entered by pressing and holding Volume Down key + Center key + Power button till the time you see a green robot on your phone screen. Make sure you have Open Odin in your computer. Click on ‘PDA’ to select the .md5 file from the extracted folder and then finally click on ‘Start’ button present in Odin to start the process of firmware update. Now enter your device into recovery by pressing these buttons at the same time: Volume UP + Center + Power button. In recovery mode, select ‘wipe data/factory reset’ and the ‘wipe cache partition’ and then select ‘go back’ and then ‘reboot system now’ to restart your device into normal mode. And you have successfully accommodated the update. Congrats, you have now successfully rooted the T-Mobile Galaxy S2 Android device on the latest version of DXLP9 firmware.